Because everything was unfinished when we moved in, there were no shelves or anything mounted on to the wall. I was supposed to finish putting up the trim but that hasn't happened because it involves measuring and power tools and is more than a 20 minute job which is all that I have time for after work. On my lunch break I bought some shelves for the kitchen and put them up. 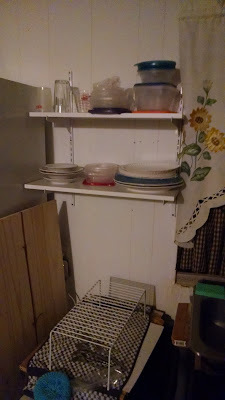 They aren't pretty but they are very useful so I bought more shelves for the storage room. Everyday when I come home from work I take a few more things off of the messy countertop and attempt to organize them in the storage room. It is finally cool enough in the back room so I can spend 20 minutes fussing with stuff before I start sweating. 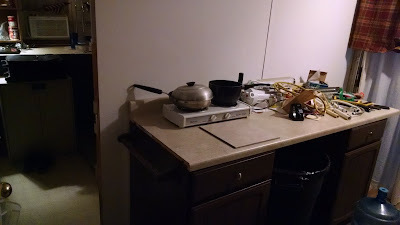 Every little bit helps though, as you can see, I was able to move my little 2 burner stovetop out to the counter instead of in my bedroom. If you look through the door way you can see where the cooktop used to be, in front of the window A/C. It was very awkward and unsafe to cook there. Soon I will have the rest of the counter cleared off and organized in the back room. I need more organizational tools, perhaps a pegboard to hang my tools on so that I can see them. 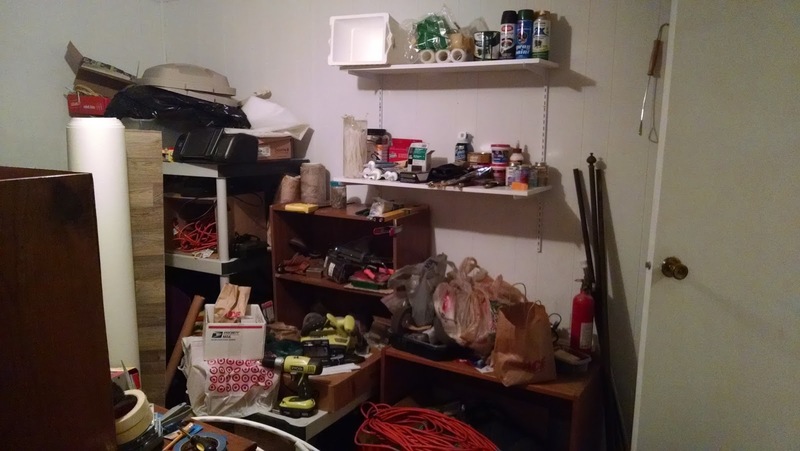 I also need more hooks and clear plastic tubs for organizing plumbing and painting supplies. I have a long way to go but I am working at it little by little and seeing some progress. I still have a wall cabinet to put up in the kitchen area and I hope to buy more shelves when I have extra funds which won't be for a while. I thought my rental house had a new tenant but I guess it didn't work out. The property management company called me yesterday to ask if I was flexible on the price. We decided not to lower the rent because they said the house is getting a lot of interest and it has only been vacant for a month. 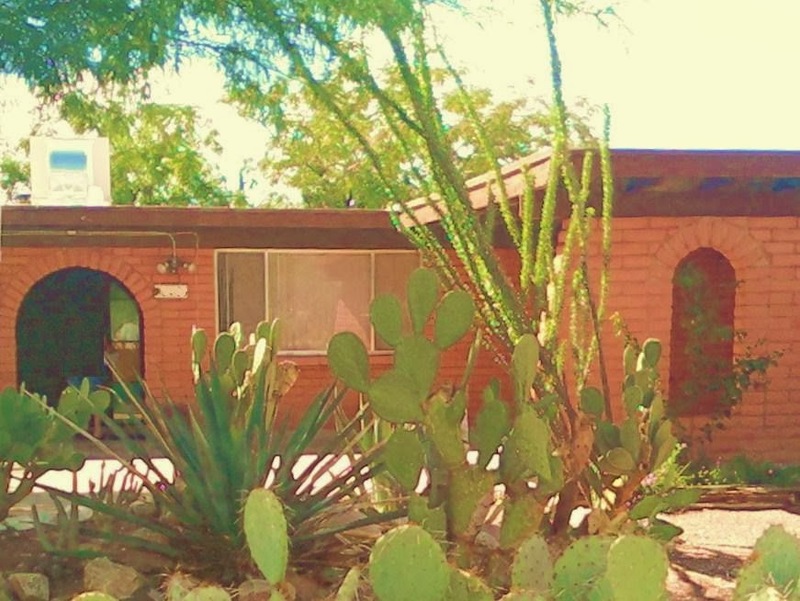 Until it is rented I have to pay for the electric and water bill and I am without $850/m in my budget. I added this photo for my mother. 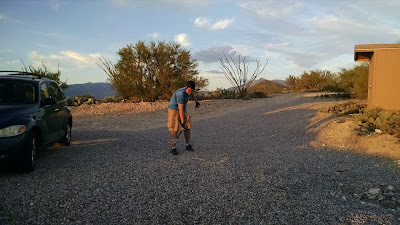 When my nephew doesn't turn in a homework assignment he has to spread gravel on my driveway. At first I was just going to restrict his video game time but then I thought, why not make the punishment benefit me? He has had to do it 3 times but I think he is being more careful with his homework. Every time I see a zero on his online grade record I ask him if I need to get more gravel delivered and he manages to get the assignment taken care of like magic! You are getting there. Honest! Your nephew looks well old enough to be helping out. Nothing wrong with child labour! Lizzie, that's right, I have a whole list of other chores for him. As you know, my to-do list is never-ending. thequiltingdoberman, I know, online grades are great! The only problem now is when teachers take 2 weeks to get grades in. I'm like, grade those papers faster! I want instant gratification.